Chemical vapor growth of cylindrical structures comprising monomolecular graphitic sheets was first observed decades ago, but the fabrication of single-walled carbon nanotubes (SWCNTs) and multi-walled carbon nanotubes (MWCNTs) remains a relatively emergent technology. These quasi-one-dimensional structures are increasingly used as a material reinforcement, with great potential for use in nanotechnology engineering, electronics, and pharmaceuticals. Particle analysis of carbon nanotubes is routinely carried out to determine the stability of the material under distinct thermodynamic conditions. Despite the inherent hydrophobicity of SWCNTs and MWCNTs, it is important to monitor the aggregating potential of carbon nanotubes in solution to determine their stability in dispersive media. Dynamic light scattering (DLS) and zeta potential particle analysis techniques can be used to assess the aggregating behavior of carbon nanotubes that have been treated with amphiphilic surfactants. In an experiment to characterize the stability of single-walled carbon nanotubes in solution, the constructs are dispersed in a surfactant media to separate them into their individual structures. This solution is then sonicated and subjected to centrifugal mixing at speeds of up to 3,000 RPM. Aggregated material separates from the supernatant and any individual nanotubes with superior surfactant coatings. The DelsaMax Pro was then used to analyze the size and stability of the carbon nanotube solutions through DLS and phase analysis light scattering (PALS). After flushing the flow cells with deionized water, roughly 300 micro-liters (μl) of each solution was introduced to the instrument through the injection port where the temperature was set at an initial 20°C with an incremental increase of 1°C/minute. Particle analysis through DLS and PALS methods were performed simultaneously to collect the particle size and zeta potential of the individual structures, the aggregated structures, and the macro-properties of the solution. This particle analysis experiment found that nanotube-surfactant solutions had zeta potentials exceeding 40 mV at all temperatures of between 20 – 50°C, which is generally considered a stable value. While the increase in temperature did not detrimentally impact the electro-kinetic potential of the solution, it did increase the hydrodynamic radius of coated nanotubes, reflecting a potential increase in the hydrophilic portion of the surfactant coating and indicating that neither SWCNTs or MWCNTs aggregated at higher temperatures. Assessing the behavior of carbon nanotubes in solution is critical for applications where the structures will be applied in dispersion. 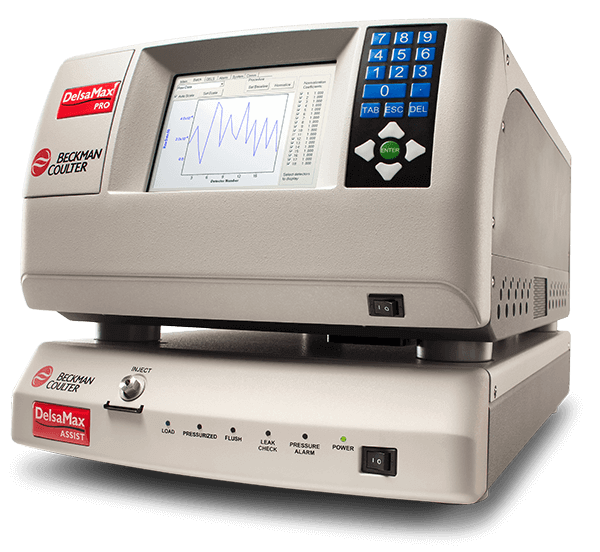 The DelsaMax Pro offers distinct advantages for particle analysis in this field, as established electron microscopy and atomic force microscopy can only perform particle analysis of substances deposited on a substrate. Particle analysis using the DelsaMax Pro provides simultaneous DLS and PALS particle analysis for determining the size, mechanical behavior, and stability of carbon nanotubes in solution rapidly and with high levels of precision. Meritics sources the most precise particle analysis instrumentation available for cutting-edge materials characterization. Our equipment operates on multiple methods using leading technology to acquire particle geometries and characteristics with outstanding degrees of repeatability. If you would like any more information about performing particle analysis of carbon nanotubes, please do not hesitate to contact us. and answer any questions you might have.